Licht op de Aquariusmystiek: How can we forgive? How often do we forgive? How often do we say excuse me, I'm sorry, please forgive me. And how often do we forgive others for what they did to us? Probably too little. Have you ever thought to forgive someone who has done you wrong? If a person cannot forgive and therefore cannot 'let go' the negative experience, the law of cause and effect is maintained, action - reaction: you do something, I do something back, sometimes you're the victim, the other time the offender. Because that resentment is still there. Forgiveness is not about the other person, but about you: releasing the load that you carry with you. To blame someone else, is one of the best ways to stick to a problem. Forgiveness is accepting the fact that the past cannot be changed. In forgiving, the understanding changes. In forgetting you lose the lesson. Anyone can hold a grudge, but it takes a person with character to forgive. When you forgive, you release yourself from a painful burden. Forgiveness doesn’t mean what happened was OK, and it doesn’t mean that person should still be welcome in your life. It just means you have made peace with the pain, and are ready to let it go. Does it happen that thoughts keep you awake about something that you have done to another, which you actually regret? A feeling of guilt that just won’t go away, and occasionally reappears? Fair chance that it would like to be healed. When people are being hurt, we have feelings like sadness, pain, fear, anger, but we ARE not those feelings; and we have a brain, but we are not our positive and negative thoughts. As humans, we also have the opportunity to participate as observers to view from a distance what is in us: For example, our roles we play in life in control and incapacity, or see our victim- and perpetrator roles. None of us can escape this. We are all in it, and we all enjoy or suffer from it. These are our lessons in life. Of whom are you thinking? How would he or she have been led to treat you like that? If you do not wish to play this 'game' any longer, you might think of forgiving, so that you finally can process this incident and can let go of your heart ache. What two people have held a lifelong separated and has made them as enemies facing each other, can be lifted in a single moment of love. If we no longer assume that bills need to be settled, we rely entirely on our hearts. For at once we understand that love is the natural space of the open heart and open mind. Caught as we are in our melodramas, we all too easily forget that together we are part of a process. People are connected to each other by the collective memory and by the flow of love; and also through our actions we are examples to each other as well. In short, we influence each other all the time and therefore we are all part of each other. Forgiveness is a quality where you abandon grudges and no longer cling to a separate identity. It means you enter your heart, so you can also feel the pain of the other and be able to release this pain. Forgiveness comes when you open your heart for your mistakes or someone else’s . The Indian holy teacher Maharaji used to say: 'Never close your heart for anyone. For when you close off your heart to someone, you close yourself off as well." For nobody is worth to close your heart for. If you put a wall around your heart, because you cannot tolerate anymore pain, you cannot let love come inside. And with that you deprive yourself. Then it might be time to see whether we need to clear some overdue maintenance. In case of physical injuries we usually go to a doctor. With sore feelings we do not run so fast to a psychologist. But we can heal them ourselves through forgiveness. What about pride and resentment? Our forgiveness is usually blocked by pride and resentment. If resentment appears, we ARE that pride. We identify ourselves with it, and we shut ourselves off; we stock that feeling somewhere in our body. Until after years we discover that our stomach hurts or that there is pain elsewhere in our body. And we have forgotten where it originated. But we can also use that resentment as an opportunity to subject ourselves to an investigation. Because we ARE not the proudness that we have, which comes and goes and we do not need to stick to it. 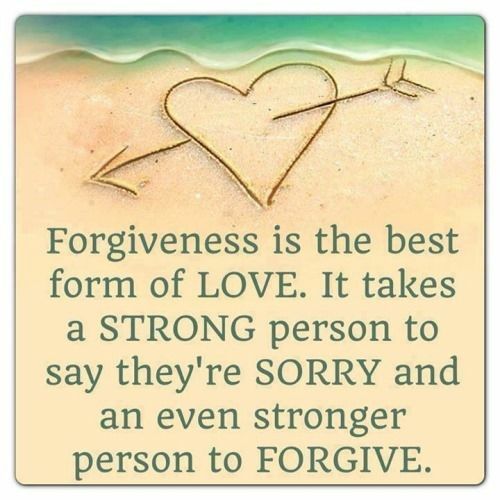 At first many people are wondering if there actually exists forgiveness in their hearts. I hear sometimes say, "Oh no, what he did to me, I will never ever forgive him." So it might take a while before this grossly neglected capacity is cultivated again. For most of us no longer go to church where we learned "Forgive us our trespasses, as we forgive those who trespass against us." If we find out that we are not quite finished with our affairs, that there is that painful attack in our hearts, we discover that each one carries the same pain. And forgiveness begins to switch into compassion. If we cherish compassion, that pain disappears, and turns into love. All this so-called separation dissolves in the One, our connection with each other. We all suffer from the same pain. And only then, when we realize this, we can clean up our mess. I think the message is that we need to learn to think with our heart, or feel with our heads. In that way we place the observer or the director in ourselves into effect, and in that case not the actor, our ego is in charge of us, but our spirit, carried by love. Would YOU be willing to forgive someone who has hurt you? When we ourselves accept our mistakes and those of others, then maybe we can forgive ourselves and others for what happened to us in our lives, and we can look differently at things. Why did those other people hurt you? What was behind their actions? We need not efface ourselves, or make us less than who we are. I was told as a child: Act normally, in that way you’re crazy enough’. And ‘Self praise stinks’. Based on experience in our young lives, we can develop behavior patterns, that are no longer needed later in life. We can learn to use our talents. And become who we really want to be, in fact, not as who we have created ourselves by conditions! When you forgive someone for what he/she did to you, then in effect you really heal yourself. Because that person has been a mirror for you in this life experience. An unprocessed emotion that settles in your body or your mind, manifests itself through a negative thought, feeling and/or behavior pattern. This is a normal reaction to a deep hurt. Take some time to get to yourself. Close your eyes, so you can concentrate better. 1. You take an incident in your thoughts where someone has hurt you deeply. It could be someone who is already deceased, but that does not matter. Play the movie again in your mind's eye. You forgive that person who did this to you... See how is responded. What do you feel? What happens? ... Even if that person cannot forgive you at this time, then this is a burden the other one has to carry. You have done everything to resolve it. Put your arms around that person that you were back then... comfort her/him...; from now on you will always be there for her/him, should she/he show up again. Take some time to experience what happens. Then come back to the here and now. The moral of this story is: do say more often excuse me, I'm sorry, please forgive me, I forgive you to each other. And see what it brings about. Happy Halloween Images, Pictures, Meme, Clipart, Quotes, Banner, Gif, Sign, Wallpaper, Games.